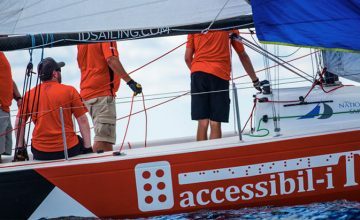 Accessibil-IT, the global leader in PDF Accessibility, was proud to be the presenting sponsor for the first blind sailing regatta ever held in Canada. The Inaugural Canadian Invitational Blind Sailing Regatta held in Oakville, Ontario from September 9-11, 2016, was an incredible experience. Blind Sailing Competitors came from as far away as the Northwest Territories and a full boat from San Francisco. The boats raced hard against each other in tight competition over three days with the Accessible Media Inc. (@accessiblemedia) boat crewed by Team San Francisco (Al Spector, Steve Bayles, Ben Smith and Philip Kum) racing to victory. Representatives from Accessibil-IT were on hand all weekend. We welcomed participants on Friday afternoon, cheered on the competitors and provided any assistance needed. We enjoyed getting to know the participants and we are grateful to the people who travelled to get there and helped make the regatta such a success. We enjoyed attending the closing dinner and celebrating all of the accomplishments achieved over the weekend. This event wouldn’t have been made possible without the amazing effort from National One Design Sailing Academy, and the other sponsors; Accessible Media Inc., Fastoche, Access Abilities, CMS Web Solutions, Yolanda’s Sputino Casa, Mill Street Brewery, and the volunteers from Dog Guides of Canada. We’re excited for next year’s event already. Stay tuned for further information and how to be involved.